The larger portion of the year 2010 was a particularly difficult time in my life. Feelings of loneliness, depression, anxiety, and hopelessness were all too familiar to my daily routine. One day in February of that year, a small package arrived in the mail addressed to me with the return address containing my own address and the sender’s name noted as Secret Friend. Inside was a little note and a package of Godiva chocolates. I don’t do well with mysteries, but I did quite well with the delicious gift. My spirit had been lifted in that moment. I tried to get to the bottom of who the sender might be, but could not figure it out. Then March came around and I received another package in the mail sent in the same fashion. I was so touched and still so mystified. I even started to analyze the handwriting with other cards I had received in the past. I remain stumped. Then April brought a spiritual message and May brought a thoughtful gift for Mother’s Day. The remaining months of 2010 were each filled with a package or note being sent to me from my Secret Friend. Then in January 2011, my final package arrived informing me that my year with my Secret Friend had drawn to a close. I never did figure out who the sender was; although I have an inkling. What I do know was that I looked forward to those arrivals. I felt of the love this woman had for me in a time where I felt so unlovable. 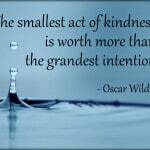 I felt the joy that comes from friendship and small acts of kindness. The treasured gift of friendship and our role in nurturing those relationships is what I wanted to share today. This has been at the forefront of my mind, as I am homesick for many of my friends who live far away. Plus, as I have been struggling through the roller coaster of pregnancy emotions, I have realized again how crucial friendships are in my life. Sadly, I have done little to nurture those friendships that bear the burden of being long distance. I’m ashamed to admit that I’ve lulled myself in to believing that following people on Facebook and Instagram is sufficient in keeping a friendship alive. As I’m sure you know, this is not the case. Nurturing friendships requires more than observing another’s life through what they choose to share on social media. However, at the same time, it may surprise you the impact you can make in a friendship through even the smallest of acts. The operative word being acts. Nurturing a friendship, or relationship of any kind, requires action. I’m not telling you anything you don’t already know, but perhaps a reminder to actively engage with our friends is needed. I know I need it. Having moved out of state a year and a half ago from everything I had ever known, I have watched as friendships have slipped by the wayside. I’m quite familiar with the three types of friends we encounter in life – those we have for a reason, those we have for a season, and those we have for a lifetime. The thing is, I have a lot of lifetime friends that I have failed to actively engage with since moving away. It’s not in my nature to do this, so it’s been disheartening to me. Part of me wonders if I’ve stopped nurturing these friendships out of pure laziness or out of protecting myself (you know how sometimes connecting with somebody makes you miss them more)? Regardless, I’ve learned that not only do I need these lifetime friends in my life, I want to feed these relationships in the same manner that I have been so richly blessed – with surprise packages, thoughtful texts, a shoulder to cry on, or a phone call just because. The beauty of a friendship is that nurturing it doesn’t have to be filled with grandiose things. 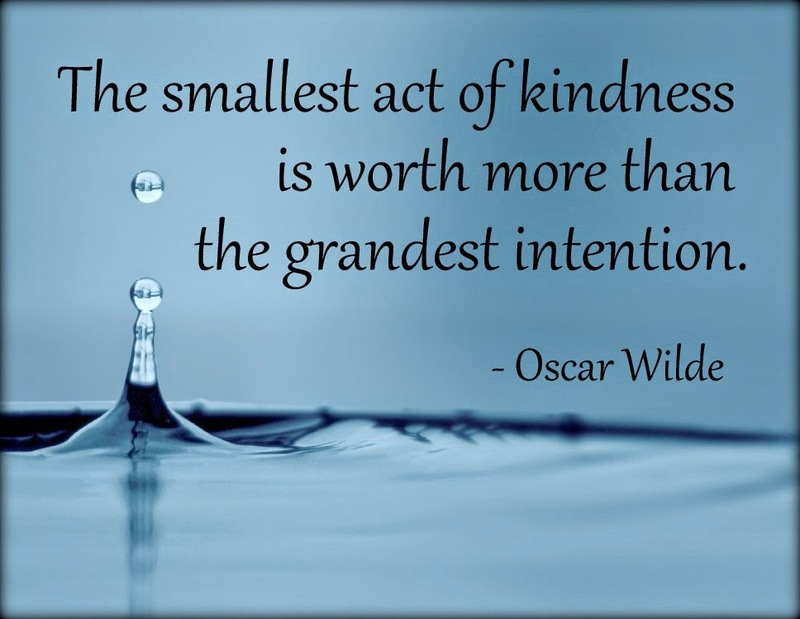 Oscar Wilde said, “The smallest act of kindness is worth more than the grandest intention.” How true that statement is! I had the pleasure this past week of catching up with one of those above mentioned lifetime friends. It seems silly to think that a phone call qualifies as an act of kindness, but boy did it fill my heart with more joy than I anticipated. I laughed so freely as we went on and on about all the craziness of life. How grateful I am that we had a moment to actually talk rather than merely intend to call one another. I was also blessed to receive a call from another friend who lives miles away, though we did not have the opportunity to catch up, who just wanted to chat. I felt of the love of these women despite the many miles between us. I think what it comes down to is that things have been rather tough for me as of late. This pregnancy has not served my emotions well. And I’m learning how blessed I have been to have such beautiful friends placed in my life to help lighten my load and increase my joy. These friends, whether they know it or not, are re-inspiring me to actively engage in the world around me. Each kind gesture brings me the same feelings of love that I felt with those monthly packages I received back in 2010. I want to be better about returning that same joy and hope to friends and family. I’ve grown tired of caring for relationships superficially. So, kind readers of Over the Big Moon, please share with me those acts of kindness that you have either given or received that enriched your relationships. My goal is to engage more fully with the many wonderful people that have been placed in my path. Loved this post Sara! Thanks for the reminder! I like to send nice cards in the mail or by e-mail. =) I hope they brighten someones day. Thank you for the wonderful post. A beautiful article. It has prompted me to be a better friend. Thank you for your inspiration. I totally agree! I still recall this group of teenagers that were standing outside of a restaurant. They were just chatting and hanging out. I was exiting with a stroller and I guess my struggle could be seen through the glass windows. I had not even made it to the door before a teenage boy on the other side went and grabbed the door to hold it open for me. Then he simply returned to his conversation with his friends. I was so impressed by his simple act of kindness.